Wash lettuce leaves and pat dry with paper towels. Tear into bite-size pieces and place in a bowl. In a small bowl, add remaining ingredients except olive oil, anchovies and croutons. Mix well. Whisk while adding the olive oil so dressing does not separate. Then whisk in the anchovies. Set dressing aside. 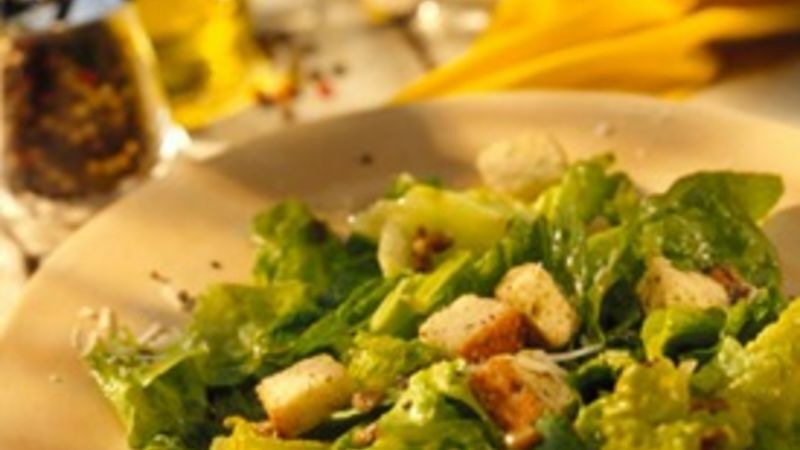 Assemble salad just before serving: Add croutons to top of lettuce pieces, then gently drizzle half of the dressing over the top of the salad. Place remaining dressing in a small pitcher for diners to add more as desired. Serve immediately.